We take many large systems for granted. However, the infrastructure and institutions we use today were not built as a finished product. Rather, they were slowly built over decades phase by phase. Examples of phasing are all around us. The University of California system started with one campus in 1868. By 1955 it had six campuses, and now in 2017 it has 10. The Interstate Highway System, airports, and telecommunications networks have been built and expanded over generations. It does not usually make sense to plan and build a complicated and large piece of infrastructure at once. 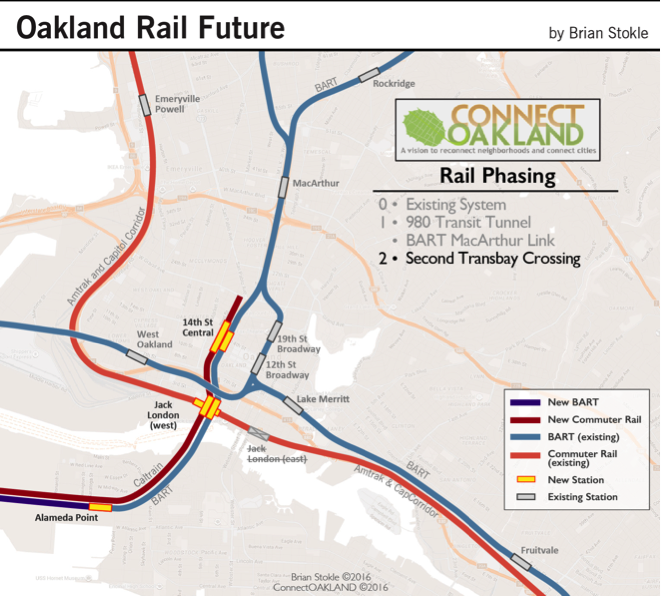 Earlier blog posts highlighted how the ConnectOAKLAND vision would benefit Oakland and how it would better connect the Bay Area to Downtown Oakland. Today we examine how this complex idea can be built through careful phase design and by prioritizing moving people ahead of moving automobiles. Building each phase separately provides immediate benefits to Oaklanders. Different phases help to test the concept and allow fine tuning based on real world results. Building each phase separately over time spreads financing across decades. Funding is also easier to attract with real world results from previous phases. Even if phases are separated by many years, the project will still benefits Oaklanders and other people using it. ConnectOAKLAND believes the following steps are the best way to turn our vision into a reality. Although complicated, we hope this vision will seem just as obvious to future Bay Area residents as the Bay Bridge looks to us today. This is just one approach to achieve the vision. We recognize that there may be other approaches, and we look forward to achieving the best solution possible. Building the 980 Transit Tunnel to Jack London or Alameda offers BART service to these places lacking regional access. This will provide benefits while the region decides where to put the 2nd Transbay Crossing and how to connect it in San Francisco. Connects emerging jobs and housing opportunities with efficient transit. Construct the 1 mile transit tunnel and stations along I-980 with the 0.25 mile MacArthur BART link. Evaluate how the reduction of the highway affects regional networks and calibrate future phases. Build the boulevard over the completed transit tunnel and 14th St Station. Open traffic to the boulevard, and fill the remaining I-980 trench to allow for housing, office, open space and other construction. Optional: build the tunnel linking Jack London Station to Alameda along with Alameda Point station. The completion of the first phase would allow the first new BART line in decades – a shuttle that we call Purple Line. The Purple Line would run from either Concord or Richmond to Alameda stopping at the three new stations: 14th St Central Station, Jack London, and Alameda Point. A commuter from Walnut Creek could get to work in Downtown Oakland on the Purple line to 14th St Station. The new line would help more than just downtown workers: a university student in Alameda could take the train to Downtown Berkeley to reach the University, and Rockridge residents could go to an A’s ballgame at the potential Howard Terminal stadium by exiting at Jack London Station. Similar benefits would also come from a Richmond to Alameda line. The ferry could also play a bigger role for East Bay commuters by connecting passengers arriving on BART at Jack London Station via BART directly to the Ferry Building in San Francisco. 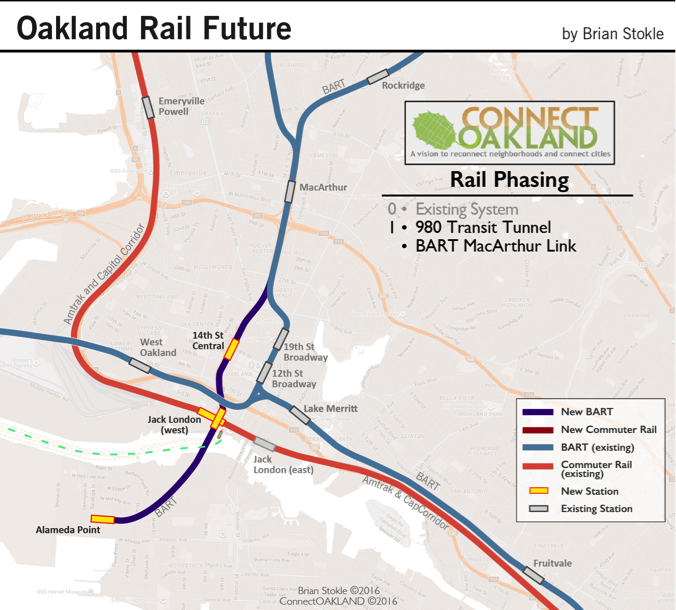 Linking the East Bay with San Francisco is a critical piece of the Connect Oakland 980 vision. A second Transbay tunnel alleviates ridership demand today and in the future. The new Transbay will increase capacity and by reducing overcrowding on the original Transbay tunnel and allow more frequent trains. A new BART line will link San Francisco and East Bay residents to SoMa jobs and multiple East Bay job centers. Caltrain will connect Peninsula employment opportunities to millions of residents in the East Bay, and Peninsula residents to Downtown Oakland jobs. A new Transbay tunnel will allow more access outside of typical commutes. A redundant connection will also allow all-night transbay access for all. A second Transbay tunnel creates resiliency for transit infrastructure [link to previous post]. If the “Big One” hits, we will be happy we have a backup tunnel! A second Transbay tunnel strengthens links between Downtown Oakland and Downtown San Francisco and improves job access for tens of thousands of Bay Area residents. There is no current agreement on the best way to build the five mile second transbay crossing. We could build the crossing as a bored tunnel, an immersed tube (like the current BART tube), or as a transit bridge. Whatever the design, the construction should connect Downtown Oakland to Downtown San Francisco. We could build the crossing with two BART tracks, but a hybrid BART/Caltrain design would be more useful for the Bay Area. The BART Purple Line from MacArthur will connect the East Bay to San Francisco via Downtown Oakland and Jack London. Caltrain service will connect San Francisco and the Peninsula to Downtown Oakland. In this phase Caltrain terminates at the proposed 14th St Central Station. Amtrak passengers would connect to San Francisco by exiting at a new ground level Jack London Amtrak station at Howard Terminal. From there they would enter into the underground Jack London BART/Caltrain station and catch a train across the bay to San Francisco. Eventually, the Amtrak Capitol Corridor and San Joaquin lines will switch to electric power, like Amtrak lines on the East Coast. These trains could then run through the Transit Tunnel and on to San Francisco through the 2nd Transbay Crossing. 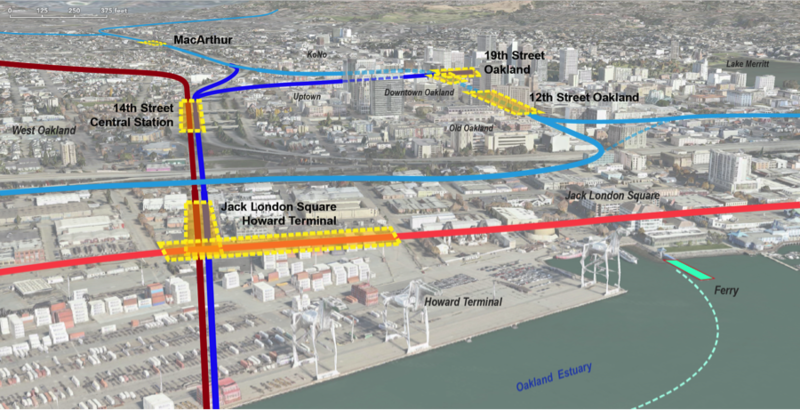 Finally, Oakland would serve as the terminal station for Los Angeles to San Francisco to Oakland high speed rail service. The San Pablo-Emeryville Tunnel reroutes Amtrak and Capitol Corridor service directly to the Oakland 14th St Central Station. This allows trains from Sacramento to reach San Francisco through new transbay connections. More frequent Caltrain trains from the Peninsula will also stop in Downtown Oakland and continue on to Emeryville, Berkeley, and Richmond. A two-mile tunnel would be built under San Pablo Avenue connecting the I-980 Transit Tunnel under Brush Street to the existing rail tracks in Emeryville, just south of Powell Street. The tunnel could be built with minimal disruption to San Pablo Avenue if it was bored through the ground. The East Bay Bridge Shopping Center could be redeveloped with a new transit station and more housing, offices and retail. Capitol Corridor and San Joaquin trains currently run on diesel power. Both lines should be converted to electric service once the San Pablo Emeryville Tunnel is open. Long distance Amtrak diesel trains would still follow the tracks around the Port of Oakland and stop at the above-ground Jack London Station at Howard Terminal. However, moving Capitol Corridor and San Joaquin trains underground would greatly improve pedestrian safety at Jack London Square. Undergrounding would also allow the Amtrak trains to run all the way to a terminus in San Francisco. 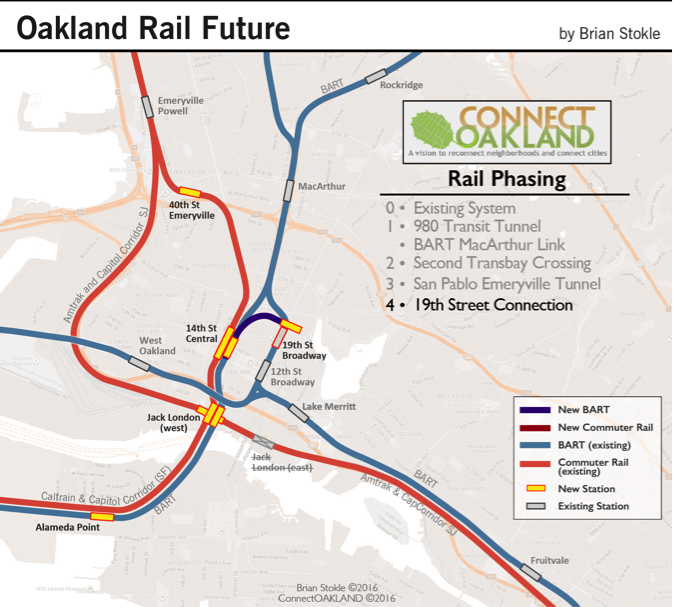 The final phase of the ConnectOakland plan connects the 980 Transit Tunnel to the existing 19th Street BART station. This tunnel improves service between lines. Some 2nd Transbay Tube trains could be diverted to a new station at Broadway and 20th Street for transfers to the existing 19th Street station, so Green Line and Blue Line passengers could use the 2nd Transbay Tunnel while the first Transbay Tube is closed for repairs. A three-quarter mile tunnel would be built under an east-west street, possibly 20th or 21st streets to the Central Station under the existing Broadway BART tracks. Finally, this phase will also build tail tracks to allow storage and other operations. The tunnel and configuration will be built to be compatible with optional future extensions. People coming from the southern and southeast portions of the East Bay (e.g. Hayward, Pleasanton, and Milpitas) would take BART to the 19th Street Station. They would go to a new platform on the lower level to board the new rail line passing through 14th St, Jack London, Alameda Point, and other stations in San Francisco. Even if 24-hour train service only used the new tunnel, someone ending work in San Francisco at 3am could take a train via the new crossing, passing through the Jack London and 14th St stations, and ending at 19th St station. From 19th street they could transfer to the Orange Line to get to their home near Union City station. The Bay Area could be build these all these phases over 15 years or 50 years. It’s up to us to decide if we want to see this vision to reality in our lifetimes and to figure out how to pay for it. The area will likely change between now and the completion of the project, the needs of transit will certainly change, and the design of phases will be developed will change in response. Using a phased vision makes putting a shovel to the ground much more likely, even if designs and details change and allows us to build the transit that we need when we need it. I am very intrigued by this idea. I am wondering if any thought has been given to cost. What will the various phases cost? Also what would the funding mechanisms look like? Would the 980 tear down be a Alameda County only tax? I assume there would have to be infrastructure taxes across all Bay Area counties. Is that correct? No comprehensive cost analyses have been carried out yet. The corridor recently received a modest amount from the recent BART bond to begin preliminary studies in 2018. Regardless, the funding will have to be contingent on when the tear down will take place. If removing I-980 can be considered as an early phase of the 2nd transbay tube it would take advantage of regional, state, and federal funds. If Oakland takes the lead while the rest of the region sorts out the transbay project, then funding would be more reliant on Alameda County funding. Additionally, communities throughout the country have received state DOT funding to remove highways and avert future maintenance funding.